The way our phones ring is important because we need to make sure we are able to distinguish them even when we’re in a crowded and loud place. 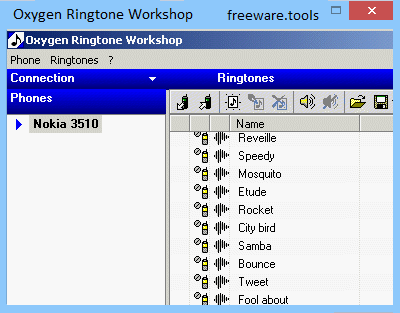 Oxygen Ringtone Workshop is a tool created for Nokia phones. Oxygen Ringtone Workshop Program is designed to manage and upload ringtones for Nokia mobile phones. You can work as jednohlasými and polyphonic melodies. The program supports MIDI files. You can also download ringtones from the mobile phone, so pick him back up. When you connect your phone to a computer (USB cable or infrared) program will also show you all the tunes stored on your mobile phone and their size. The program has a simple interface that is quite easy to figure out by users of all levels of experience. The app is built to help you control standard and custom ringtone for some Nokia models, such as 3510, 3510i, 3530, 3590, 5100, 6100, 6800, 7210 or 7250. Although these models aren't the most recent ones, they are still heavily used. In order for the program to work, the phone must be connected to the computer via cable or infrared port. Furthermore, the utility can work with several phones simultaneously. The app can load, read MIDI files and save them to disc. Also, it can delete all custom ringtones from the phone in one swift move, thus saving you a lot of time. Oxygen Ringtone Workshop displays the file size, type and name of all the tracks saved on the phone. These can be listened to on the PC in preview mode. All in all, Oxygen Ringtone Workshop is a nice program that can come in handy if you haven’t yet upgraded to the latest smartphones on the market. Individuals with little to no experience with similar programs shouldn’t have any problems while installing and customizing this tool, thanks to its intuitive layout and overall simplicity.